Anterior cervical discectomy and fusion (ACDF) is a surgical procedure performed to treat a damaged disc in the neck area of your spine. Discectomy literally means "cutting out the disc." An incision is made on the skin of one to two inches and horizontal and can be made on the left or right hand side of the neck. Retractors are used to gently separate and hold the neck muscles and soft tissues apart so that surgeon can work on front of the spine. The thin platysma muscles under the skin is then spilt in line with the skin incision and the place between the sternocleidomastiod muscle and the strap muscles is then entered. Next,a plane between the trachea/esophagus and the carotid sheath can be entered. 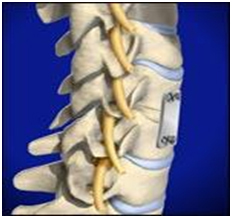 A thin fascia covers the spine which is dissected away from the disc space. Then a needle is inserted into the disc space and an X ray is done to confirm that the surgeon is at a correct level of spine. After the correct disc space has been identified on X-ray then removed by first cutting the outer annulus fibrosis and removing the nucleus the soft inner core of the disc. Dissection is carried out from the front of the back to a ligament called post longitudinal ligament often this ligament is gently removed to allow access to the spinal canal to remove any bone spurs or disc materials that may have extruded through the ligament. A layer of bone is shaved off the flat surfaces of the two vertebrae. This causes the surfaces to bleed. This is necessary to help the bone graft heal and join the bones together. The surgeon measures the depth and height between the two vertebrae. A section of bone is grafted from the top part of the pelvis. It is measured to fit snugly in the space where the disc was taken out. The surgeon increases the traction pull to separate the two vertebrae, and the graft is tamped into place. The traction pull is released. Then the surgeon tests the graft by bending and turning the neck to make sure it is in the right spot and is locked in place. Another X-ray may be taken to double check the location of the graft. A drainage tube may be placed in the wound. The muscles and soft tissues are put back in place, and the skin is stitched together. The surgeon may place your neck in a rigid collar.